Forums - Bricks in Motion » Contests & Festivals » EASTER Brickfilming Festival - Results! Topic: EASTER Brickfilming Festival - Results! The votes for the EASTER Brickfilming Festival 2011 are in! We received 31 entries and everyone who entered voted, so no disqualifications. Thank you to everyone who entered - the final results were pretty close - and to Danimation for running the contest with me. With 16% of the vote, the entry with the third most votes was BrickOnLife's The EASTER Bunny! This film manages to build up a great atmosphere in such a small space of time and is very deserving of a place. With 22% of the vote, the second place winner is MovingBricks with his film E.A.S.T.E.R.! MovingBricks provides us with some great lighting and special effects, not to mention a quick laugh. The overall winner of the EASTER Brickfilming Festival 2011, with 25% of the vote, is Cottontail Jones by the ever-reliable BuilderBrothers! The idea they chose was certainly not an obvious one, but it certainly worked. A clever story, and one that has won you the grand prize! 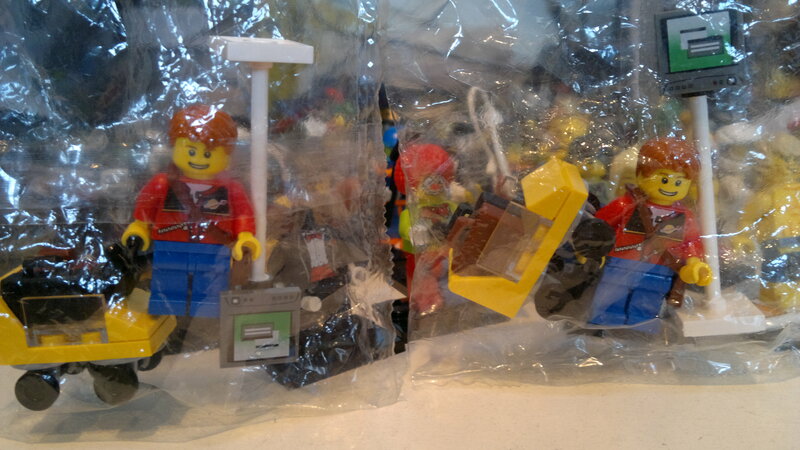 Both prize winners here will receive one "passenger" minifig each, built inside the bag. Keep it in the bag or take it out and use it, I don't mind! 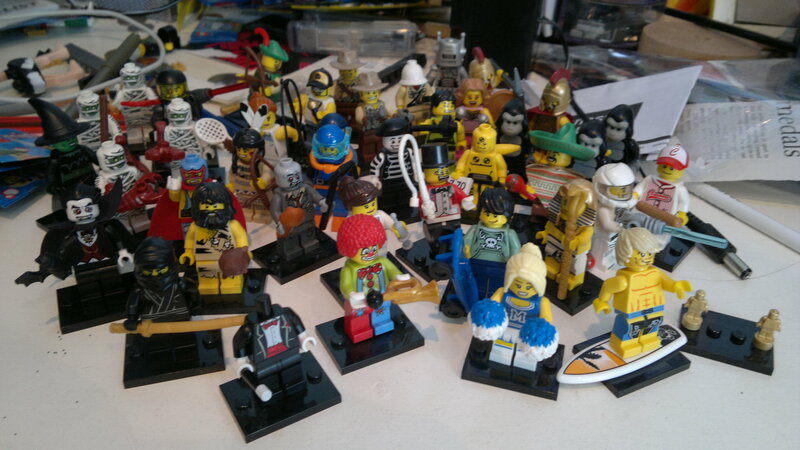 Should your film receive the most votes, you will receive one collectable minifigure of your choice (as long as it's in this picture). Some of the accessories (or in some cases, whole minifigs) are missing, but I'm sure I could find them for you if that's the one you want. Should the winners wish to claim their prizes, send me a PM. Yes, I will need your address so ask permission from whoever runs your household before letting me know where to send your little plastic men. That's the end everyone! See you again...? Re: EASTER Brickfilming Festival - Results! Congratulations to the winners! This was certainly an interesting contest. Congrats to all the winners! Can we see what votes the others got? I won't be posting the full results, but contact me if you want to know how your film did. I'm happy Cottontail Jones won! I voted for it Congrats to BuilderBrothers, MovingBricks, and BrickOnLife!!! Great job everyone!!!! and congrats BuilderBrothers, MovingBricks, and BrickOnLife!!! We voted for Super Pig, we thought it was really creative. Still, the winning entries certainly deserved their places. These entries were superb. Congratulations! I didn't enter at all but those who did, GREAT JOB! Everyone's a winner in my book. Sig by RealBrick. I now make sigs, avatars and YouTube backgrounds free of charge! Just PM me, titled one of the options. Back after taking a VERY FREAKING long break. 14 months, I believe. Anyways I'm going to be making films again. Much better ones. Congratulations to everyone who entered! I loved all of the films! Congratulations to all of the winners! They all deserved it. Congrats to the Builder Brothers and the other people who got in the top 3. Congrats! This was a great contest! Aw. I thought I had a chance. But to be honest they were over the top films. Great job everyone! I'd love to have this festival again. Hooray to the winners! Congrats BuilderBrothers, your entry was awesome! Great job everyone, and congratulations to the winners! This had a such a great turnout for a short, transient, event!